Every living thing from bacteria to President Barack Obama is made of carbon from exploding stars. Billions of years ago, motes of carbon and other stardust formed the Earth. 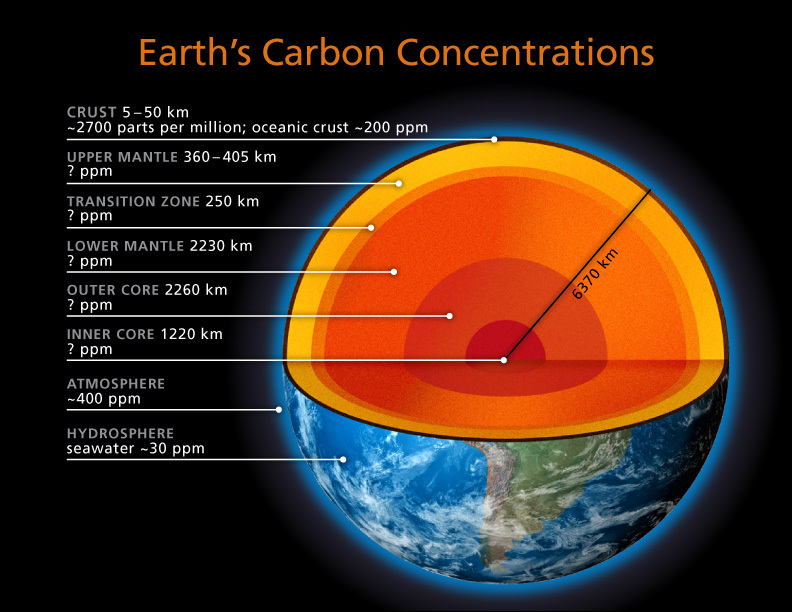 Carbon is the basis of all life but most vanished deep inside the planet, researchers now believe. And surprisingly, life thrives inside the rocky layers kilometres below our feet. “Microbes survive by eating rock at those depths,” said Robert Hazen, executive director of the , a decade-long, global collaboration investigating the inner workings of the planet. “Life is very different under those tremendous pressures and temperatures,” Hazen told IPS. The variety of bacterial life at extreme high-pressure depths worldwide constitutes a subterranean “Galapagos”, he said. There may be as much as half of all life in the ground deep below us, according to one estimate, although Hazen thinks that might be too high. “Drill a hole one or two kilometres deep just about anywhere and you will find a sparse but hardy microbial community,” said Isabelle Daniel of l’Université Claude Bernard in Lyon, France. “These deep microbes, which live in the tiniest cracks and fissures in rocks, survive on the chemical energy of minerals,” said Daniel, who is one hundreds of scientists involved in the Deep Carbon Observatory (DCO). DNA analysis reveals a diversity of microorganisms, mainly single-celled. However, deep below the ocean floor live fungi-like organisms with complex cell structures. Researchers estimate that these are extraordinarily long-living organisms, conceivably living for millions of years. “There are also a huge numbers of viruses, their DNA carefully inserted into living cells,” said Hazen. These deep earth viruses don’t kill their hosts. Rather, they stay dormant for hundreds of thousands of years waiting until a cell has enough food to reproduce and then they become active. Life may have even first begun kilometres below ground, researchers speculate. “The deep subsurface may have acted as a natural laboratory for the origin of life, in which multiple ‘experiments’ could have been carried out in tandem,” said John Baross of the Seattle-based University of Washington who co-edited “Carbon in Earth”, a book summarising the first three years of DCO research. The book was launched at an International Science Meeting Mar. 3-5 at the U.S. National Academy of Sciences in Washington, DC. “The DCO may find totally new kinds of life as we reach greater depths, higher temperatures and pressures. And quite possibly Earth’s deepest life doesn’t use DNA and proteins the way normal cells do,” Baross said in a statement. Carbon is the Earth’s most important element. Not only is all life made of carbon, virtually all materials that humanity relies on are made from carbon, such as plastics, oil, drugs, dyes and building materials, said Hazen. “No other element contributes so centrally to the well-being and sustainability of life on Earth, including our human species,” he said. The carbon cycle at the surface is well understood. Animals inhale oxygen and exhale carbon dioxide, while plants “inhale” carbon dioxide and “exhale” (respire) oxygen. But there is another very long-term carbon cycle that takes enormous volumes of carbon from the depths of the planet and brings it to the surface by way of volcanoes and upwellings at oceanic ridges. Carbon is removed from the Earth’s surface in subduction zones where the ocean floor sinks and continental plates slip under each other, said Rajdeep Dasgupta of Rice University in Houston, Texas. “In tectonic (earthquake) zones, surface carbon dives back into the Earth’s mantle,” Dasgupta told IPS. This is a form of carbon sequestration and is of keen interest given the skyrocketing increase of human emissions of carbon into the atmospheric that is causing climate change, he said. Oil, coal and gas are mainly carbon from plant matter that has been pushed and held underground for millions of years. Burning these fuels releases this ancient carbon. Over geologic time frames (millions of years) the planet modulates the amount of carbon in the atmosphere by burying it deep below ground, said Dasgupta. One of the objectives of the DCO which completes its work in 2020 is to determine how much carbon is being “exhaled” and buried by this deep, long-term carbon cycle. “Carbon is amazing, fascinating and fundamental to our well being. We need to know as much as we can about it,” said Hazen. Find this interesting? Please support independent environmental journalism. Click here learn more. Humbling to say the least. I wonder what these subterranean microbes look like!